In 2015, Serena Williams, First Rate Tennis Champion, and Proud African American, Rises Above the 2001 Fray of Venomous Bigotry, which was directed at her and her family, at the Indian Wells Tennis Tournament in California. 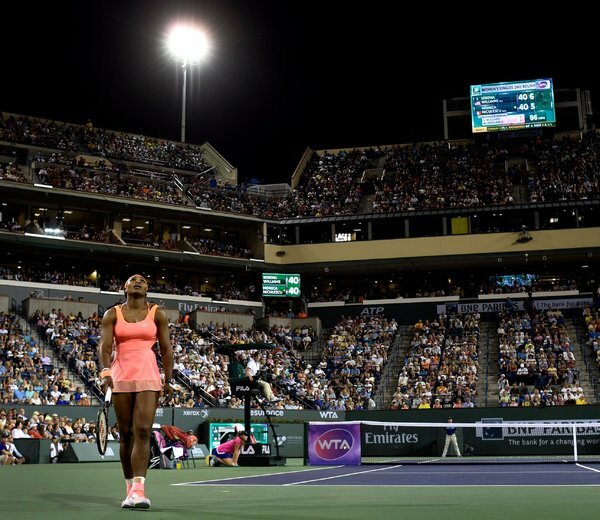 And in 2015, when so many areas in America are in racial turmoil, she returned to the Indian Wells Tennis Tournament. Just to be certain she would be safe, security guards were strategically placed throughout the stadium: a sad but necessary commentary, and precaution, in 21st Century America. Read what the New York Times had to say about her return: "Serena Williams Strikes the Right Note in a Time of Turmoil." This is a great story on so many levels. "Richard Williams added the extra dynamic of power, and that, as much as anything else, set off many fans at Indian Wells 14 years ago. A black man controlling the product in an almost all-white, country club sport was bad enough. Possibly exercising the power that went with that control seemed to be too much to bear. The result was outrage from the fans, followed by a boycott from the Williamses. Acts of racism must be punished whenever they occur, and while we certainly can forgive — African-Americans have been in the forgiveness business for centuries — one can still make sure there are consequences. In this case, the consequence would have been one of the greatest players in tennis history sending a painful but clear message to a community that she felt had wronged her and her family. On the other hand, journalists sit on the sideline and record — even cheer — acts of defiance by athletes ranging from Muhammad Ali, Tommie Smith and John Carlos in past years to today’s athletes wearing “I Can’t Breathe” T-shirts to protest police brutality. These acts of defiance carry consequences; there is a price to be paid for challenging the status quo. Just ask anyone who has." What does this say about America as a society? http://www.nytimes.com/2015/03/13/sports/tennis/serena-williams-str...? In her first match at the Indian Wells tournament since 2001, Serena Williams won in two sets against Monica Niculescu. Credit Paul Buck/European Press photo Agency. INDIAN WELLS, Calif. — Ray Moore sat in an office at Indian Wells Tennis Garden Stadium on Friday evening, the picture of a weary but contented man. Thirty minutes earlier, Moore, the 68-year-old chief executive of the BNP Paribas Open, had watched Serena Williams complete a hard-fought, 7-5, 7-5 victory over Monica Niculescu on a night of heartfelt emotions as fans celebrated a great champion’s return to the tournament after a 13-year absence. He was in the stands that March evening in 2001 when Richard and Venus Williams were showered with boos as they entered the stadium to watch Serena, then 19, play in the championship match, which she won. From Moore’s perspective, having Serena back was an act of cleansing. Serena seemed genuinely happy, and relieved as well. In what had to be a first in her illustrious career, she wept as she entered the stadium and heard the ovation. Williams conceded that even though she had announced her return in February, she had doubts about it as late as Friday night when she walked out to warm up for her match. There were debates — and there will continue to be debates — over whether she should have returned. There no longer is a debate in her mind. “What I said was if anyone dares boo, the crowd will shut them down,” Moore said. “But if somebody yells any racist remarks or makes any reference, that person is going to be ejected. Our security was ready for that. For all the talk about forgiveness, there is a lesson here — not just about the importance of being forgiven, but also about the equally important, and very much overlooked, aspect of the forgiven being truly repentant. And a great day for the community of Indian Wells. Sports of The Times: Serena Williams Strikes the Right Note in a Time of Turmoil, 3/12/15 http://www.nytimes.com/2015/03/15/sports/tennis/a-victory-for-both-...? OneWorld Progressive Institute, Inc., is a small group of committed volunteers who produce community information and education television programs on health literacy, education and civic engagement. We also find good information and post informative blogs about issues we believe shine light and are beneficial to many in our communities. Learn more about us at our web site: www.oneworldpi.org/ and visit our Civic Engagement section at: http://www.oneworldpi.org/civic_engagement/index.html We are about Civic Engagement & Public Good.